Welcome to my new game, CREEPERZKILLYOU IN ISOMETRIC TOWN! In this game, creeperzkillyou runs out of pizza to eat, so you must go to the shop & help him buy some! But be careful, there's game over round every corner! Oh, BTW, it was him who helped make my intro! 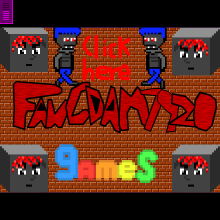 I made this game for the 'Function Game Drop (FGD)', Function INC's very own competition! To join Function INC, follow this link: remotefunction.comuf.com Thanks for playing!